“In the unlikely case of a landing on water…”! Three years ago today Meredith and I were landing at Kennedy Airport, on a flight from London, at precisely the same time a couple of hundred other passengers were experiencing an altogether less agreeable experience of landing in the middle of the Hudson River! The plane had hit a large flight of birds just after taking off from La Guardia Airport which disabled its engines and forced the pilot to take the perilous decision to use the Hudson River as a “runway”. Using nearby Newark International Airport wasn’t an option–it was too far. All 155 people aboard Flight 1549 — 150 passengers and five crew — survived the crash-landing, thanks to the experience and cool of the pilot–Chesley Sullenberger III. He was hailed as a hero and was interviewed countless times in the media, in the weeks following the crash landing . He retired from US Airways and its predecessor airline after 30 years with them on March 3, 2010. Captain Chesley B. 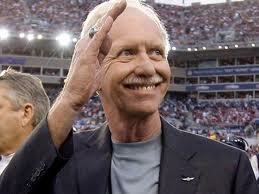 (Sully) Sullenberger at the Super Bowl XLIII pre-game ceremony on February 1, 2009. After the trauma of 9/11–a good news story for New York City. *The New York Times report. The flight was headed toward Charlotte, North Carolina….just a few miles north of where I live. This past weekend, all the survivors met at the local air museum to tour (for the first time) the aircraft, which was moved here last summer. You are right…this continues to be the feel-good story of the decade. It created an unlikely-looking hero in Sullenberger, but it’s great to see our heroes redefined. I may live in the beautiful Blue Ridge Mountains of Virginia, now, but New York City will always be my home town. I was born there. And I was there for 9/11 and will be there in spirit always. Thank you for remembering the US Airways miracle landing and I am glad you were both on a less “adventurous” flight that day. The event was a surprising three years ago, but I hope it will be remembered for a very long time. We need good news from time to time. Thanks Elaine–my maths escaped me! Well, I guess being old – that is, getting regular deposits in the experience bank – ain’t so bad after all. He is an amazing man. There are many unsung heroes out there saving lives every day; it’s heartening one of them received recognition; and that his age/experienced was valued. Thank you for sharing, Robin! on January 16, 2012 at 3:15 pm | Reply Dianne P.
Whew–can’t believe you were so close to that other event! One question: Can you swim?? While watching the news about the cruise ship these past few days, it makes my husband & I wonder a bit–it’s a Carnival cruise line, which we had taken years ago. And he CAN’T swim…! Meredith and I must stop tempting fate–we stayed on the very island of Giglio 18 months ago! on January 16, 2012 at 11:14 pm Dianne P.
Geesh. It looks like a pretty place, too. My husband reminded me of another “interesting one” in the summer of 2005. Had planned a holiday to the UK, when my sister called at 6 AM the morning we were to fly over. “They bombed London!” she cried into the phone. My sleepy mind immediately recalled images of the blitz! It was the tube bombings. Flights were postponed, but 3 days later, we found ourselves in London. Traffic was so snarled, though, we abandoned the taxi & walked, dragging our luggage behind us for 4 miles. Stopped to shop & eat in Soho, then decided to “get the heck out of Dodge” and took a train north! Later, back in the US, we found out some friends of ours had been in King’s Cross that VERY MORNING, buying tickets upstairs when the lights had flickered out! Then, soot-covered people started emerging from the underground… Our friends decided it was time to go home! Yes! Well, this reminds me that life is precious and unpredictable. Amazing this event coincided with the birthdate in 1929 of Dr. Martin Luther King Jr.? Both men made a difference in the lives of so many – as you are, Captain Poldark/Robin Ellis, with your wonderful book and enthusiasm for your cause! Thank you, Katherine. You too are thoroughly committed and out there spreading the word that needs spreading. Thank you, Robin. In fact, I just saw another client whose Diabetes Type 2 has been completely reversed. He said his doctor was surprised, but my view is he shouldn’t have been. It is possible! It’s always good to hear that someone has stabilised the condition. Sounds like he/she is well motivated to keep it that way. Hi Robin – we’d just arrived for a visit to Washington when this happened so we were glued to the footage all afternoon that day ….despite my being a nervous flyer. It was a most impressive feat by the pilot. I first heard that full transcript of the conversation between the pilot, tower and others on my return to London -Eddie Mair played the full recording on “PM” on Radio 4, and then said “That put my day into perspective, how about yours?” It’s very interesting to hear it again. Hello Ruth–it was in the end and quite quickly a wonderful day!